This is an unassembled bare cylinder head with valve guides and valve seats installed only. Does NOT include any parts such as valves, springs, spring components, studs or guide plates. A tremendous amount of time and energy was invested to bring you this 245cc LS1/LS2/LS6 Gen III head that represents the pinnacle in cathedral design bolt-on performance. 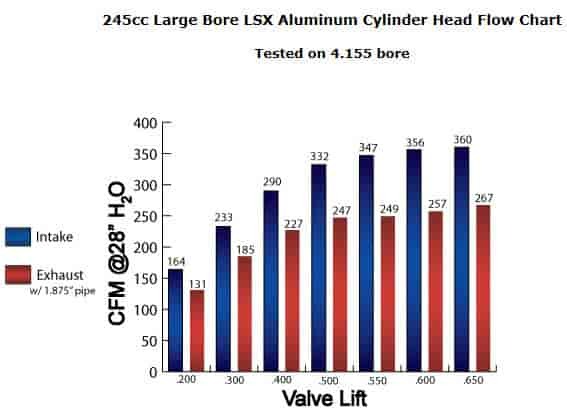 With over 355 CFM's available, it has intake flow numbers approaching GM's famed (and much larger) LS7 head with much stronger exhaust flow in comparison. This head is AFR's ''take no prisoners'' LSX cathedral shaped offering and its focus is large displacement combinations, like 415-454ci with a minimum bore size of 4.000''. It requires a head gasket bore of 4.200'' or larger and comes standard equipped with lightweight 2.160'' intake valves / 1.600'' exhaust. Another unique feature of this head is that it is ''solid roller friendly'' having been designed and machined to accept larger .375'' (3/8'') diameter pushrods without additional clearancing (in most applications) and comes direct from the factory with 1.510'' spring pockets (Note: Under no condition can these pockets be machined deeper). With an aggressive set-up this head is capable of producing power in the 700HP range while still providing gobs of low and mid-range torque. It is still a factory direct bolt on with standard length valves, stock valve train geometry, and everything in their respective OEM locations. It of course comes standard equipment with AFR's trademark 3/4'' head deck and the same rugged castings found in the rest of the AFR LSX line up. Make sure you're packing lots of displacement to fully realize the benefits that this head can offer you and hang on when its time to go 'Wide Open Throttle'! Made in USA.